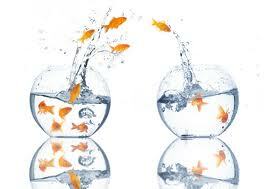 Are you feeling like a fish out of water? Do you feel overwhelmed by the social web revolution? Well, if you do, you are in good company. I have talked to many people lately, both non-technical and technical, who are avoiding using social media as much as possible, and have a long list of reasons why. How does one keep up with all the changes and the new speed of social interaction on the web? What if you don’t want to spend all your time on-line? How does one deal with the onslaught of information and social networks? Bisnode reported that 90% of the worlds data has been generated in only the last two years, no wonder people’s heads are swimming. Here are some thoughts on what we should all be doing to deal with natural social media resistance. Sometimes I think that I am the only person in the universe experiencing overload from all this digital data that is flowing into my computer, my smartphone, my TV, and my head. Then I realize that no one, and I mean NO ONE, can keep up with this data flow, unless you are a machine. So, first thing to understand is that you need to give up trying to keep up with the data flow, because you can’t win that one. The internet has significantly changed the way we do business. And social media has changed the way we manage information. The rules have changed. This is part of the reason so many of us are uncomfortable. Take email, for example, something that has been around now for many years and is probably a significant part of your life. You know what is expected of you around email rules and etiquette. If someone sends you an email, they expect an email back. If they don’t get one, they send a reminder. But, if someone ‘likes’ your comment on Facebook or Twitter, no response is required or expected. Today’s social media moves much faster and uses different rules. You need to give up your old rules because they don’t apply to the new platforms. To keep up, you need to give up your old rules. 2. Pull up the shade at least half way. Almost daily, people over the age of ____ (fill in the blank), are asking me about the seemingly blurred lines between professional, public and personal privacy online. It feels a little like getting undressed with the shades up. We were warned for years about privacy on the internet and now all those rules are being brought into question. No wonder we’re feeling assailed. The rules about privacy appear to be changing daily. I don’t think anyone really knows the answers on this topic just yet. And not knowing something as intimate as the privacy of our information is unsettling. But right now, you need to be internet smart but also give yourself some room until the patterns of interaction sort themselves out. There is no right answer in this case, at least not yet. 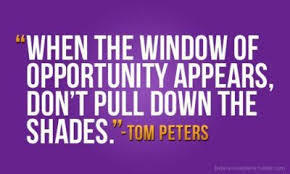 But as Tom Peter’s said “When the window of opportunity appears, don’t pull down the shades.” Though I won’t open mine 100% yet, I think we miss a tremendous opportunity if we lock ourselves out because of the privacy rules. There are so many different social media networks out there now, that it is easy to be overrun and overwrought with what to join and participate in. I recommend that you pick one personal, like Facebook, and one professional, like LinkedIn. (For more info check out 4 Steps To Decide What Social Media Network To Join). Ignore the millions of other social networks screaming for your participation because, less participation is more sanity. Spend your valuable few minutes a day in one place where you can get to know others and have meaningful interactions. You don’t have to be everywhere on the internet, but you do need to be somewhere, consistently, if you ever want to be known. Once or twice a week on Twitter or commenting in a community, is enough to start building a rapport with others. You do need to show up but it does not have to be 24X7. Pick two days to make your ‘show up’ days and spend a little time building your online presence. I have trouble with the term ‘transparent’ that is being used for social collaboration. I think that is another reason that people are uncomfortable with the medium. Transparent makes me think of that window shade being up again and everyone seeing into my dressing room. It is not about sharing every little bit of information about me on the internet, it’s about being in relationship to other people, in such a way as I can be real and speak from my heart. When I write this blog for example, I don’t fill it with hype and fluff. I share with you my genuine thoughts – the real me. OK, I admit, I’m an extrovert and I am comfortable sharing a lot of my life story, but even if I was more private, or more introverted, as long as the stuff I share is authentic, then I think the connection will be there. You don’t have to violate your privacy to be connected, but you do have to share something to make the connection, whether physical or virtual. It is like the wild west out there on the internet highway. Full of possibilities and “there is gold in them there hills.” You just need to filter through some dirt to find it. What does that mean, you say? It is up to you to decide how you want to be on the internet. Then you can learn some of the tricks to keep out the unwanted noise. What is it that you want your connection to social media to be? Do you want to increase your digital reputation? Do you want to build your business by using social media? What are the positive things that social media can bring to your life and your work? You have a lot to offer, really you do, or you wouldn’t be reading this. Share a little of who you are on the internet, in your profiles, in your comments, and though I know it may be uncomfortable at first, you will find the virtual connections not only uniquely rewarding but surprisingly freeing. Interesting blog Lorian. I was on the call and got the link. I feel one more pointer in addition to the 6 you added above is realizing the impact social can make. Once that point is understood, people flock. Thank you!